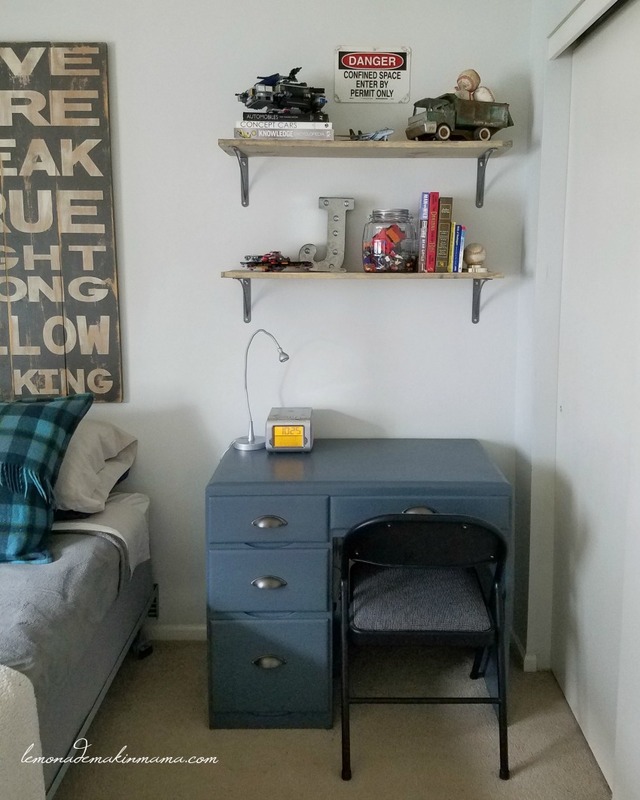 A few years ago, I was trying to convince my son that he needed to throw out half of his collected "items" and make his bedroom into a teen hangout haven. I'm sorry to say that I didn't capture any before photos. 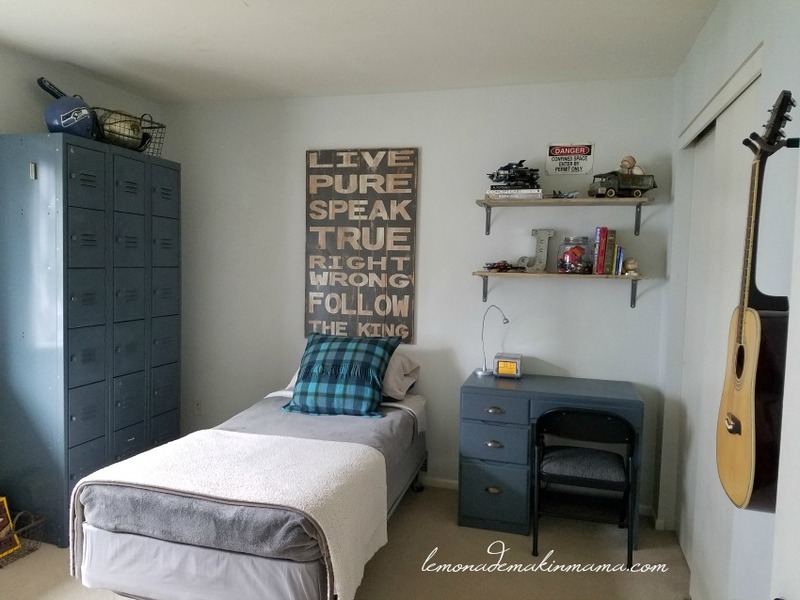 Can you just trust me when I say that as a mama who likes less clutter as opposed to more... it made me cringe and ache to get my hands on it and have my way? Mis-matched furniture... an ugly green desk... no shelf space on the walls, just a bookcase that I hated and old, tired bedding that was in need of a refresh. He still has a folding chair for his desk because this is real life... you can't always change everything at once but with a little creativity, a lot can be done in a weekend. Change is hard for my son. My daughter loves to redo things but Joe gets a bit attached to the way things are and I try to be understanding. Ah, motherhood. We worked together and it was a sweet little bonding time for us as I helped him and talked him through it. We touched up all his wall paint and I painted his desk with leftover paint from my recent coffee table refresh. 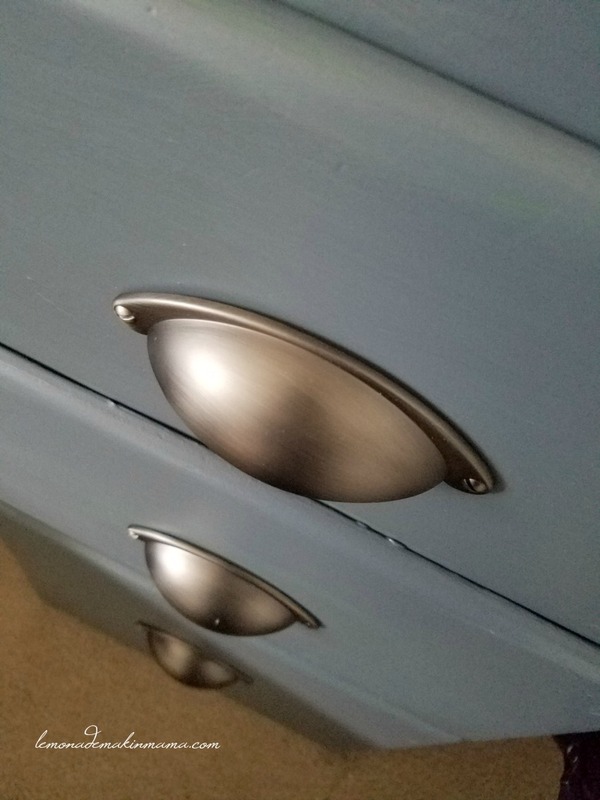 Joe chose these cool drawer pulls to finish his desk look, and I installed them. We tossed his tired duvet cover and went with his existing cozy blankets, rather than matchy bedding and I actually liked this look way better. It's very clean and tidy. (Of course I'm sure it will stay just like this too.) 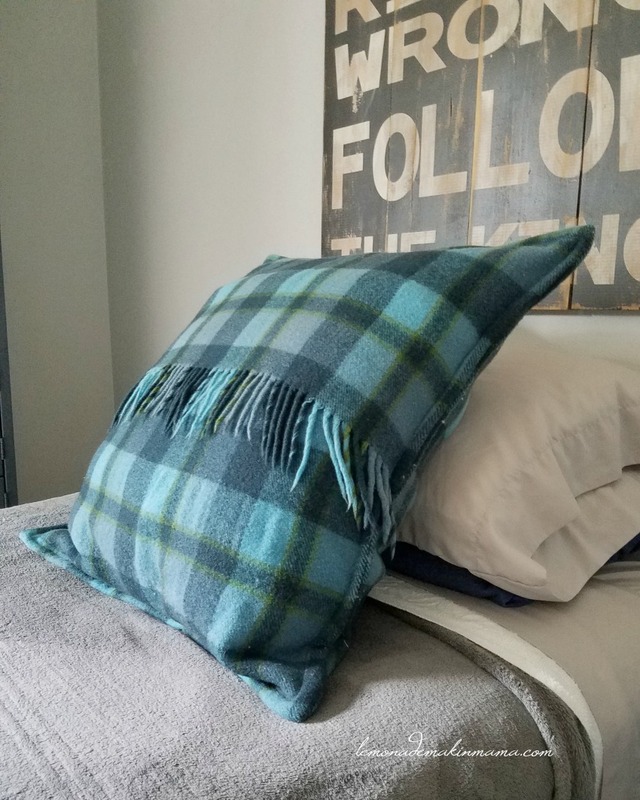 I sewed his Euro pillow cover from an old camp blanket that had a hole in it a couple years ago, and it worked perfectly in his room. I'm so glad I never got rid of it! This shelf set up was so easy. We bought four inexpensive metal brackets at Lowes and spray painted them with hammered metal spray paint. 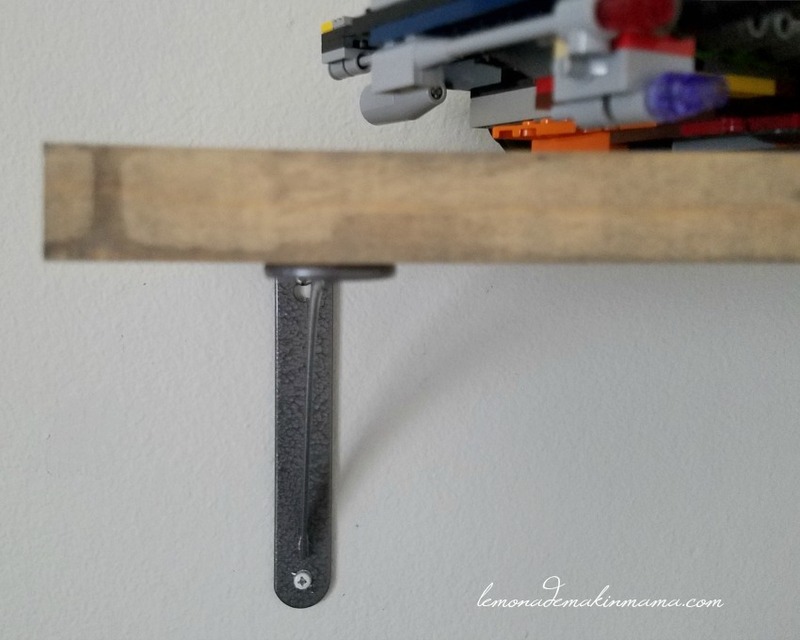 My sweet husband installed them in studs and we had a six foot board cut in half for the shelf boards. I stained them gray with leftover stain and loved the way they tied in with things. The shelf materials cost under $25. 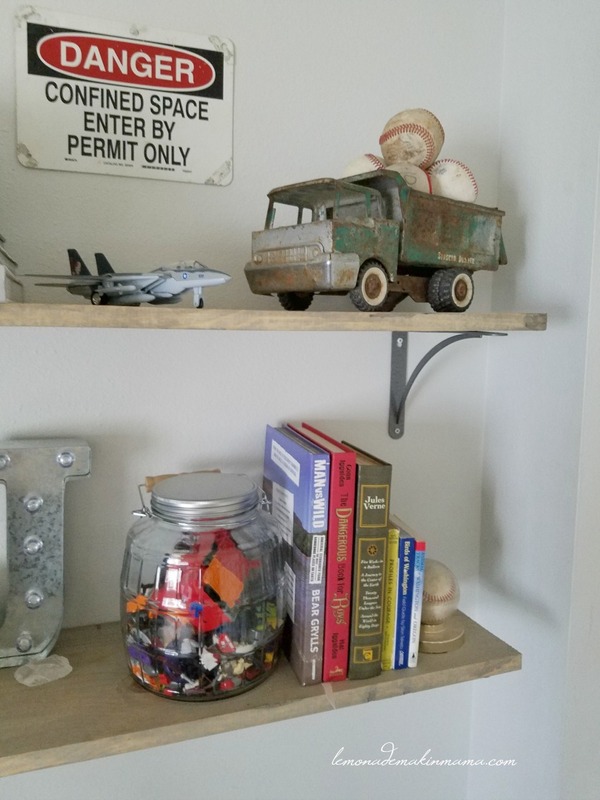 We placed the books and items that had special meaning to Joe on his shelves and I think they turned out great! 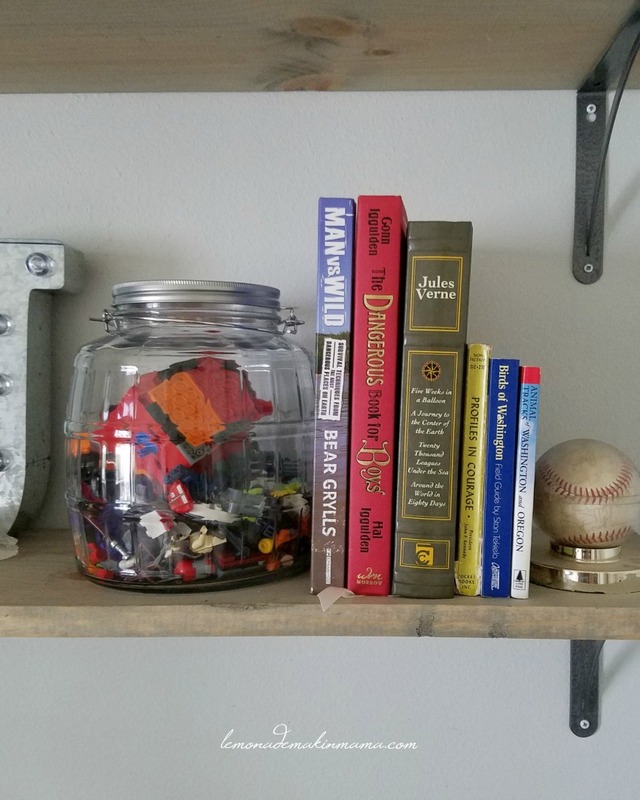 He was a big Lego lover as a little boy and would spend hours creating things. I love that a few of those creations have a place to be displayed as a reminder of his childhood. 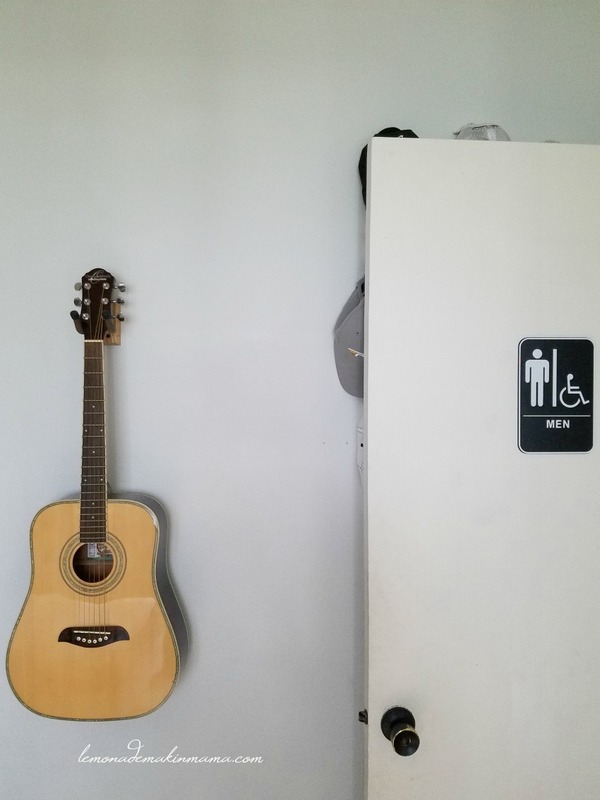 The amazing sign above his bed is something he's had in his room for years. Its from sweet Tara, at Between You and Me sign shop. 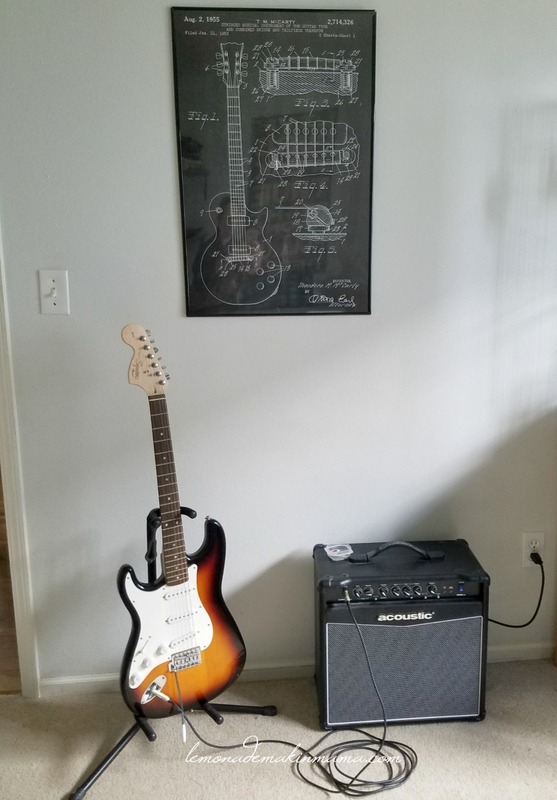 Joe loves to play guitar, and we found this print on Etsy last Christmas as a present for him (I'm sorry I don't remember the name of the shop). It's a guitar blueprint. 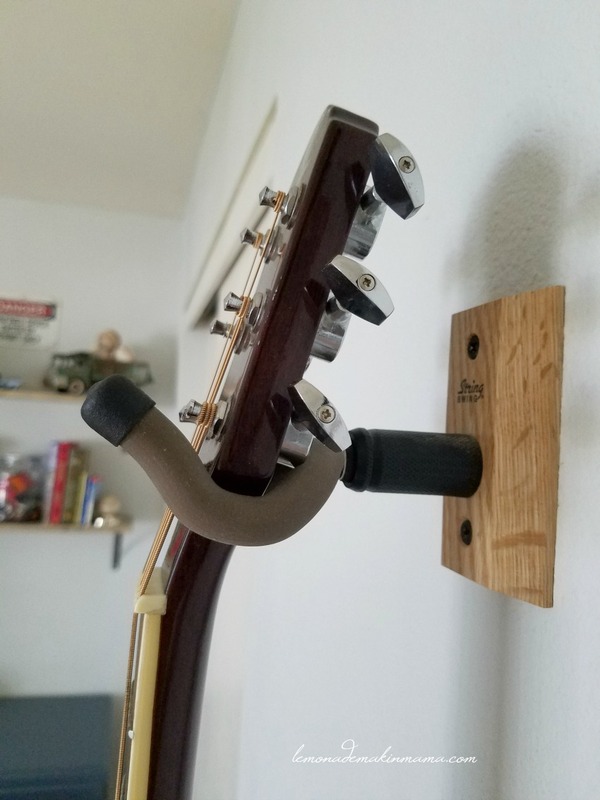 I love using wall space as much as possible for kid rooms and these wall-mount guitar hangers are a great way to keep instruments off floors. 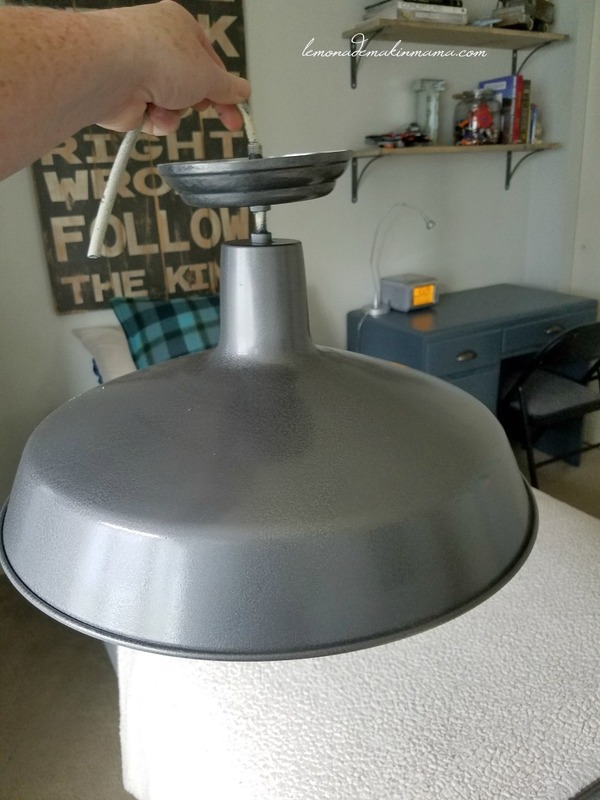 We recently changed our dining room lights and I had two of these metal barn lights from Lowe's leftover. I wasn't sure what to do with them but when this makeover began, I decided to use one of them in Joe's room. I spray painted it with more of that hammered metal paint. Joe chose an edison bulb and that's getting installed for him tonight. I'm so glad it turned out this well. I won't lie, I so wanted to quit at about the half way mark but nothing great ever happens when you put things off or quit... so in light of my commitment post I shared the other day... I persevered. Whoo! Fiddler on the roof is one of my kid's favorite movies, and you'll often hear them belting out, "Tradition...." in a loud, musical voice. Especially this time of year. I always refer to it as the falliday season. That's the season you get when you squish all the fall goodness right into Thanksgiving, Christmas and New Years. It's an entire season of hosting, gathering, memory making, and it's my favorite. (Until spring, then that's my favorite.) With only a few short years to go until my babies fly the nest, I've been especially tender over the traditions we hold dear, in the Brodeur household. The truth is, as a parent, you never know what a child is going to latch onto. I remember when my babies were small and I was desperate to create lasting, family traditions. I asked a mentor mom in my church how she cultivated them with her children, and her response stuck with me these many years later. She said, "Oh I don't know that anything I set out to make become a tradition really stuck...it was often the things we did 'because' that became a tradition over time and stuck. Like when they were toddlers and would go outside to play in the snow...I would be worried over their frozen little fingers so I'd always get mugs of hot cocoa ready. When they came inside, I'd sit them all down at the table and put a warm mug into their little hands. Over time, whenever it snowed they wanted cocoa because it was tradition, and that's how a lot of our family traditions developed." Her relaxed approach helped shaped me as a young mom in many ways, because I saw it to be true. Those times I tried way too hard, didn't take. The ones that effortlessly unfolded seemed to be the lasting ones. It was life giving too, because I longed for some of the same traditions I had growing up, but with my own twist. Since I do a lot of the same things my precious mama did, we have naturally developed a few similar traditions...but it sure took the pressure off having to do certain things in order to make them happen. When I chat with my other mom-friends, it seems that across the board, all our kids crave tradition, they just don't know what they'd call it. What they know that they love is whatever feels stable and expected. Don't we all? Life hits us sometimes and it can make us wonder if there's anyone in charge of our own stability. 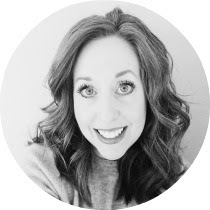 It is a lot easier to offer the kind of stability and expected traditions to my kiddos, when I've taken the time to put my heart in check first... when I've wandered close to the Savior and found my security in His presence and the promises that He goes ahead of me. P.S. This new moody pear print is now available in my shop!